« Jimmy Carter and Barack Obama: Separated at Birth? I would have structured this flowchart differently, for reasons I discuss in this post, but this is pretty good picture of why Europe is in trouble. They say all roads lead to Rome, and this flowchart shows all roads lead to a banking crisis (see this post to understand why). But not all banking crises are created equal. A bailout (the left column) would inflate the debt bubble and make the ultimate crisis much more devastating. 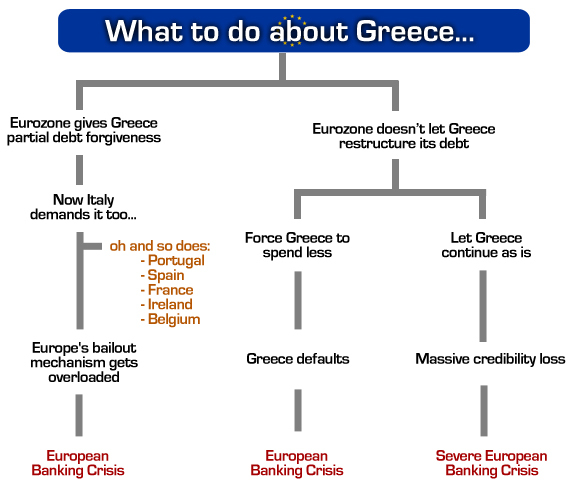 Cutting Greece loose (the middle column) is the best approach, in part because it would have a sobering effect on other European nations that would like to mooch off the European Union (German taxpayers) or International Monetary Fund (American taxpayers). Just imagine, by the way, how much better things would be today if Greece had been unable to access bailout money and instead had been forced to spend the last two years implementing real reform. That’s why I stand by everything I wrote in my first post about the Greek mess. Greece gets partial debt forgiveness. Italy and Greece demand it’s leadership resign. Banker technocrats take over leadership. Eurozone stabilizes. The Aristocrats. Europe wakes up soon/quickly … Nothing will be as before. Changing habits and customs (habits) will be radically altered. If Portugal follow the path of destruction and Greece will leave the EU and the euro will have no difficulties totals. If Portugal then Ireland in 2021 then you will see a ray of sunshine … There is no place to demagoguery, ask for money at the last moment before cliff … subject to 3 years! Why not 4 or 5 years? Lenders simply do not trust and they are dictating the laws …. Now is an urgent need to punish the guilty …. It’s the same principle with government handouts to individuals. They fight to gain more government funding for them personally instead of fighting to reform their lives. If they HAVE to find a way, they do. I couldn’t agree more that if Greece had never received bailout money it would have forced them to a permanent course correction. But obviously from your chart (which being very right brained I appreciate) They’re screwed.